A new testing method for new car emissions and fuel economy. 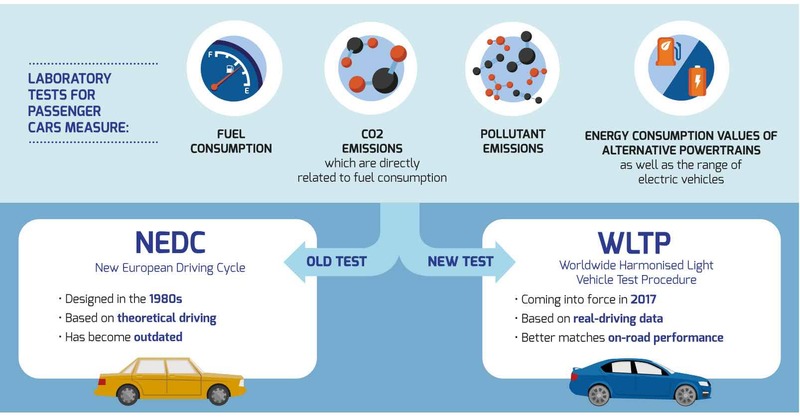 The Worldwide Harmonised Light Vehicle Test Procedure (WLTP) lab test has been created to calculate both CO2 emissions and fuel consumption for passenger cars. On September 1 2017, the WLTP replaced the old lab test called the New European Driving Cycle (NEDC). The reason for the change was due to both driving condition changes and evolutions in technology. The WLTP cycle is a better representation of everyday driving profiles, with the use of real data, taken from across the world. • From September 2017, all new model introductions will be subject to WLTP type approval and Real Driving Emissions (RDE) testing. • From September 2018, all new registrations will need to comply to WLTP type approval. • From September 2018, all new Light Commercial vehicle model introductions will be subject to WLTP type approval and Real Driving Emissions (RDE) testing. • From September 2019, all new registrations of Light Commercial Vehicles will need to comply to type approval under WLTP and all new registrations will be subject to RDE testing.